It's getting to the point where I've pushed enough cakes on my friends at various social gatherings that they are starting to realize I know how to bake. And upon this realization, we are starting to shift from my forcing them to try various experiments to them asking me to bake cakes for certain occasions. This is hugely flattering and thrilling, but also extremely terrifying. If I bake and decorate a cake for this blog and it doesn't come out well, then I don't have to post it (sometimes I do anyway). If I bake and decorate a cake for a friend's birthday and it doesn't come out well, then they don't have a birthday cake. It's slightly stressful, to say the least. Recently, my friend Christiana asked me to make the cake for her bridal shower. This was very clever on her part, because she started by half-seriously asking me to make her actual wedding cake. This request predictably and understandably sent me into a mild panic before she sensibly went with a real bakery. But that meant that when she asked me to make the less important shower cake, I was so relieved I said yes. It was like that classic trick of asking your parents to take you to Italy and then settling for Olive Garden because all you really wanted were garlic breadsticks. She got me good. And then I had to consider, what was I going to make? There were no real guidelines other than "make something that tastes good", which, duh, and "I like roses". 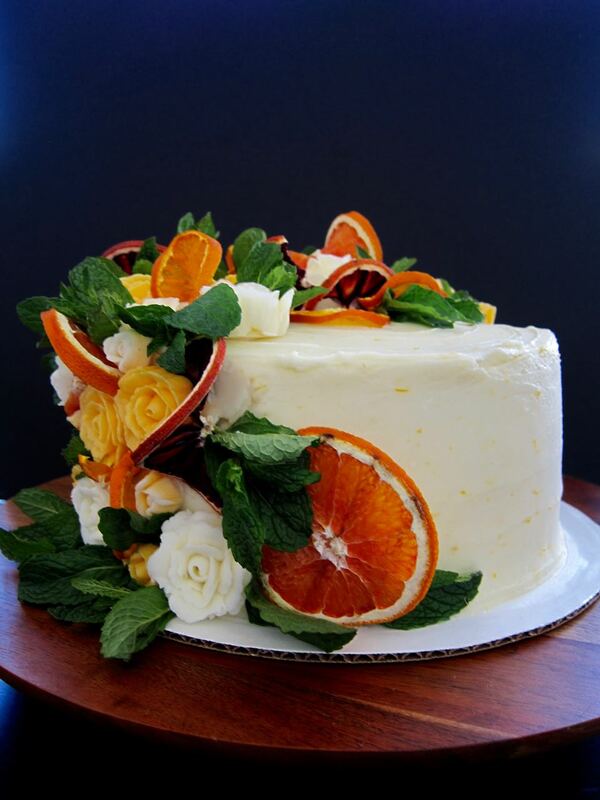 So, after two successful goes with the pink champagne cake, I decided to riff on that and attempt a mimosa cake, because it would be delicious, and the bride does love her a mimosa or two. But the roses? I'd discovered what a pain real flowers can be on a cake with this floral explosion, and I wanted everything to be edible, so I knew I'd be doing frosting roses. The only problem? I've never made frosting roses! I had the tools to do them, thanks to my Christmas present from Ginny, but I wasn't sure I had the skill or the patience to learn, no matter how fun Molly Yeh makes it look. But I wasn't going to let Christiana down, so I spend a solid Saturday making rose after rose after rose, before I finally had a bunch of roses I was happy with, and a bunch I could at least call "flower shaped". I was also well on my way to carpal tunnel, but I can worry about that later. Considering I had to chug some of the leftover champagne before I could let myself decorate, I think in the end it all came out stunning, if I'm allowed to say that. I impressed myself, at least! 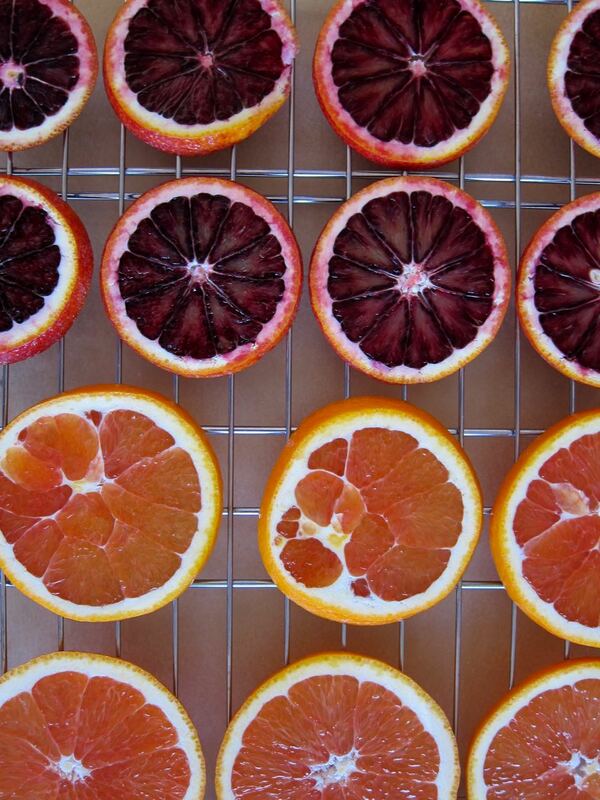 I nestled dried cara cara orange, blood orange and tangerine slices between the roses and filled it all in with mint leaves, for a jewel-toned, wintery citrus effect that I LOVED. It is my favorite cake that I've ever decorated by far. And the flavor? That was pretty amazing too! 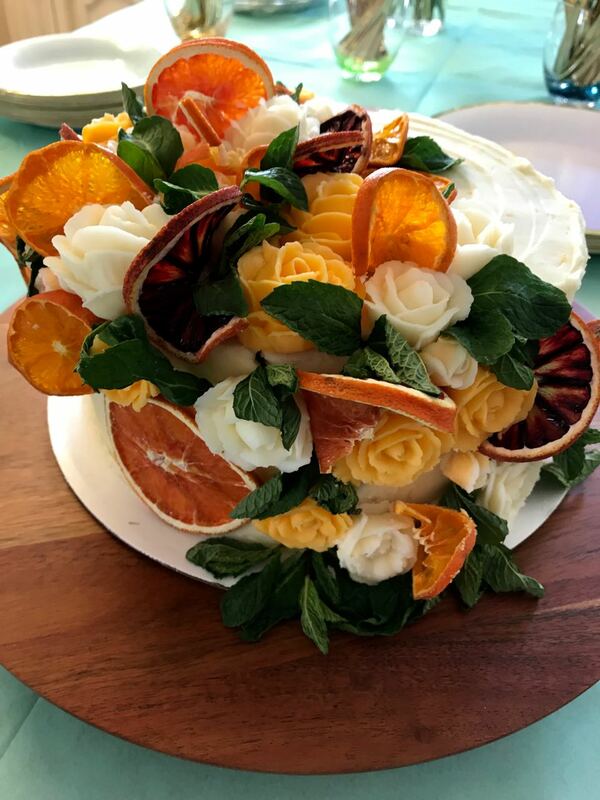 The champagne comes through so well in this cake to help cut the massive amount of sugar in the frosting, and the orange zest and curd laced throughout brought just the right floral, orange note, just like a good mimosa! I had to tell some of the ladies at the shower that I don't take orders, this is just a hobby, but I don't know, should I start? I based the cake off the doubled recipe for the Pink Champagne Cake, left out the pink coloring and added orange zest to the cake and frosting and some orange curd to the filling. The orange curd is adapted from Erin McDowell, with a little lemon juice added for brightness. This recipe makes good use of ingredients. Use your egg yolks for the curd and the whites for the cake, and using three oranges for all the zest and juice needed for the various parts. Make the orange curd: Melt 4 tbs of the butter in a saucepan over medium heat. In a bowl, whisk together egg yolks, sugar, orange juice, orange zest, lemon juice, and salt. Slowly whisk in the melted butter, then pour the mixture into the saucepan over medium low heat. Cook, stirring constantly, until thickened, about 8 minutes. The mixture may still seem thin but should coat the back of a spoon. Remove from heat and stir in the remaining butter. Strain into a shallow container and chill with plastic wrap pressed against the surface, at least 2 hours, but overnight is best. You will probably have leftover curd, but it's ok! Add it to berries, yogurt, toast, scones, whatever. Make the cake layers: Place rack in center of oven and heat to 350 degrees. Butter and flour three, 8-inch cake pans. In a large bowl, add the egg whites, champagne, vanilla and oil and whisk to combine well. Set aside. In the bowl of a stand mixer, rub the sugar and zest together until sugar is moist and very fragrant. Beat sugar and butter for 3-4 minutes on medium speed until light and fluffy. Add the flour mixture and the egg white mixture, alternating, starting and ending with the dry mix. Scrape down sides of bowl as needed. Divide the batter between pans. Bake, 23-27 minutes, until cakes are just beginning to pull back from the sides of the pans. Cool on a rack for 10 minutes, remove from pans and cool 30 minutes, or until completely cooled. Make the frosting: beat the butter on medium speed in the bowl of a stand mixer until creamy, about 1 minute. Add 6 cups powdered sugar, champagne, and vanilla and beat to combine. If needed, add more powdered sugar to make the frosting thicken and become more spreadable. Sprinkle in the zest and beat frosting to fluffy, 30 seconds on medium-high. Assemble cake: Level tops of cake layers. 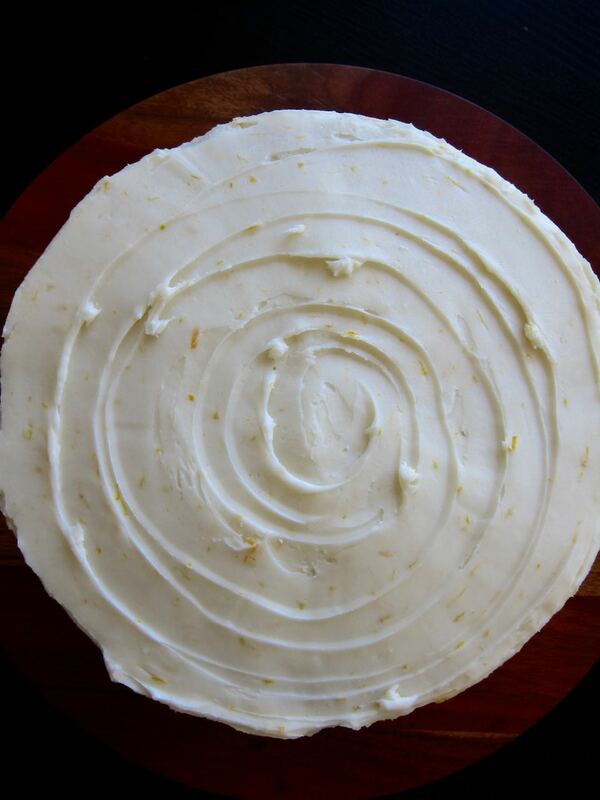 Stack layers, spread with a thin layer of 1/2 cup frosting between each and a thin layer of the orange curd. Decorate cake with remaining frosting and any extra decorations as desired (see note). Extra cake can be stored tightly wrapped in plastic in the refrigerator. I only spread a thin layer of curd between the cake layers, because my curd wasn't very thick. 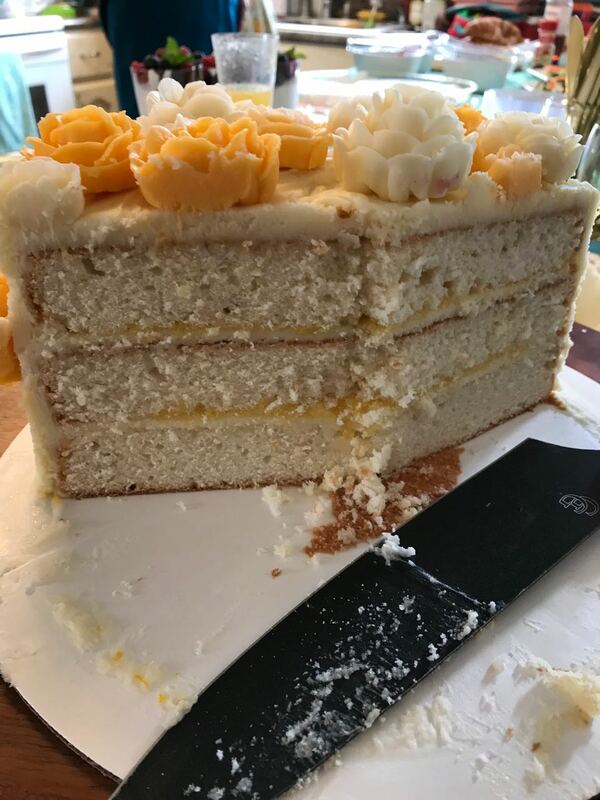 If you do end up with a thicker curd, you can pipe a frosting dam around the outside of the layers and fill with more curd, for a more prominent presence in the cake. 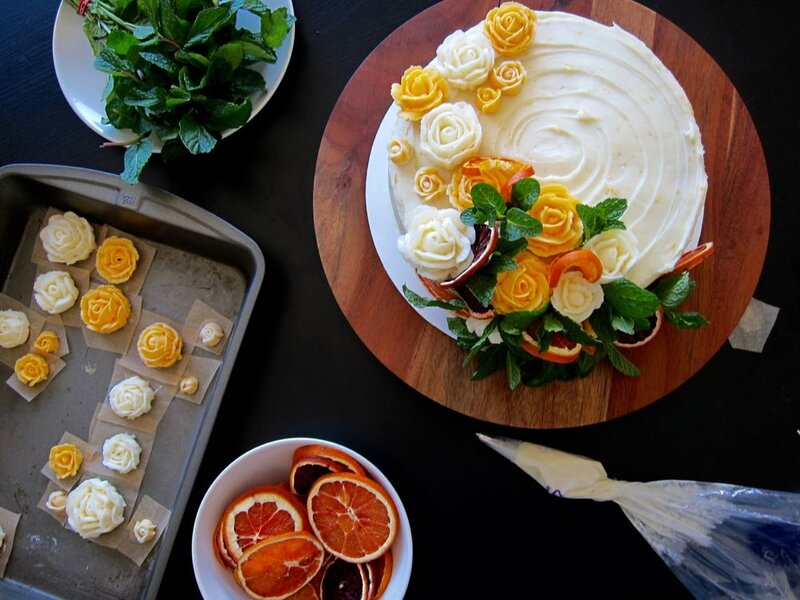 For frosting roses, you can make a smaller batch of the buttercream recipe above, omitting the zest and adding more powdered sugar to make a very stiff frosting. Use a piping bag, a flower nail, and a Number 104 tip to make roses, dyed whatever color you wish. For the orangey peach on my cake, I used a mix of Orange and Yellow gel coloring. I found this and this video to be the most helpful. 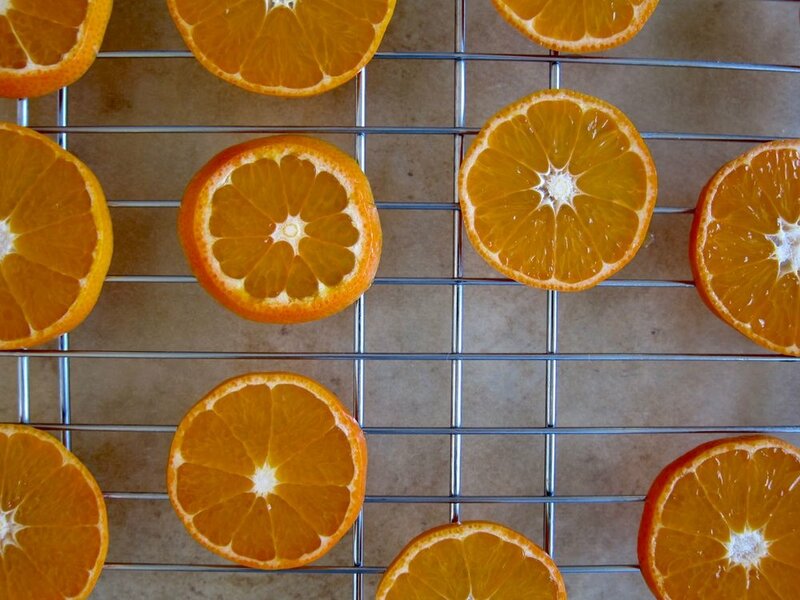 For the dried citrus slices, cut fruits to 1/4 inch slices or even slightly thinner, then bake on a wire rack set over a baking sheet in a 170-200 degree oven for 6 hours, rotating the sheets every 2 hours. They should still be a bit pliable, or if not, they will be after storing in an air-tight container for a few days. You can then arrange them how you want on the cake, cutting as needed to bend around the roses. If you are adding decorations, reserve 1/3 cup frosting for "glue" before filling and frosting the cake. 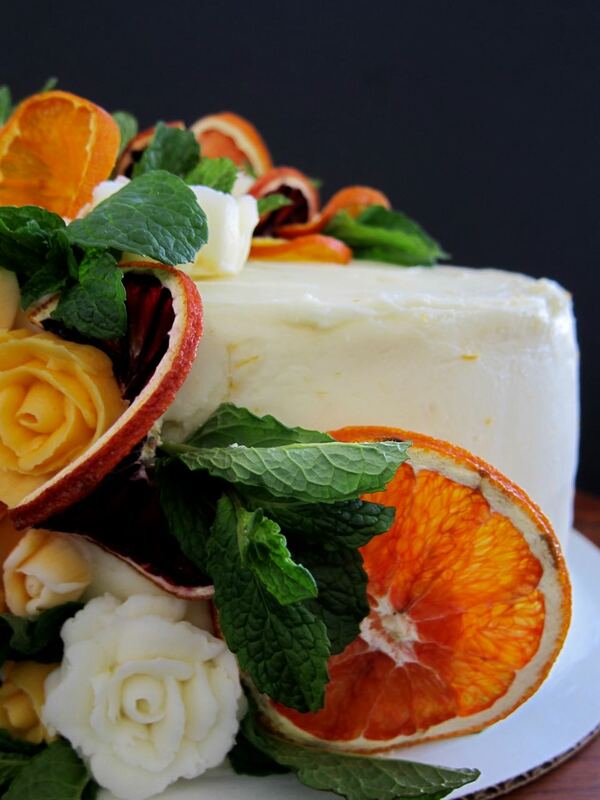 If you use fresh mint for "leaves", make sure not to add it before the day you are presenting the cake. I had to transport the cake the day before the event and store it in the refrigerator overnight, and my fresh, springy mint wilted a bit.